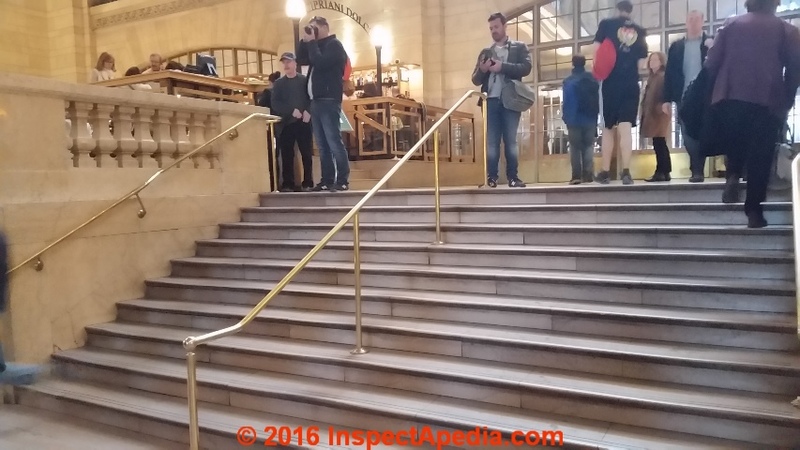 This article includes photographs, and examples of handrailings & stair & railing safety defects and gives checklists & images used in inspecting indoor or outdoor stair railings or handrails and related conditions for safety and proper construction. Our page top photo illustrates a well-designed handrailing and stair guardrail at the CIA. This article series explains and illustrate the requirements for safe, useable hand railings on steps and stairs, both interior and exterior stairways. Handrailings are a critical safety feature on outdoor and indoor stairs, and ramps, as are guardrails along landings, platforms, decks, porches, and similar structures. At left the "handrailing" was filled with running water when we photographed it at el Alhambra in Granada, Spain. This is not a particularly easy rail to grasp if one is falling down the slippery brick stairs. HANDRAIL BASIC SPECIFICATIONS height, spacing from wall, etc. Handrailing graspability: the handrailing size, total perimeter, shape, and surface characteristics. Handrails or railings are sometimes chosen for their creative or aesthetic appeal such as the handrail shown at above left. Some of the fall injury cases we've investigated involved a combination of unsafe stairs and a fall that was made worse when the individual who lost their balance tried to grasp an unsafe handrail. It's easy to be confused about the difference between handrails, stair rails and guardrails and their different uses, codes, and designs. In several building codes including the 2006 IRC Section R202 these terms are defined clearly. We add some comments. Above and just below our photographs illustrate a properly designed & installed graspable stair railing or handrail. Above is a photograph taken from the under-side of the handrail showing that when the railing is of a proper dimension and profile the hand can make a secure grasp with thumb and fingers. The hand and fingers can also pass around the stair handrailing bracket as the user walks down the steps in this buildings. Notice that by this definition a handrail may be horizontal or sloping. That is, if the railing is intended to be able to be grasped to help protect against a fall, it is called a handrail regardless of where it is installed. In our photo above, large-diameter top of the stair guardrail (red arrow) would not be graspable by someone losing their balance or beginning a fall. Before the smaller-diameter handrailing in the photo above was installed, my younger daughter fell down these stairs, unable to arrest her fall by trying to grab onto the very large diameter guardrail top that at the time also served as a handrailing. Watch out: If you build stairs with a non-graspable stair rail or guard you must provide a graspable handrailing and the dimensions, spacing, height, projection, etc. for handrails must still be maintained. A guardrail is shown by the red arrows in our photo at above left. A handrailing or stair railing is installed along one or both sides of an ascending / descending stairway, to provide a safe grasping surface to reduce fall injuries, and where stairways are open, to prevent falls off of the side of the stairs. Details are provided in this article. Temporary handrailings and guardrailings are also regulated in the workplace or jobsite, though not in private residences. Our photo above illustrates a makeshift temporary railing that the author (DF) installed using a woodworking clamp and steel piping. There was almost nothing technically correct about this temporary railing though as an expedient device it worked successfully to provide a graspable aid for climbing those three steps that otherwise offered no handrailing whatsoever. OSHA regulates temporary railings and stairs used in the workplace - details are included in our OSHA stair & rail code citations below in this article. When Are Handrails Required? How many steps, what total rise height requires a handrail? The final authority on when and where railings are required on steps, stairs, landings, balconies and decks, rests with your local building code official. The building code requirement for stair railings typically requires handrailings on stairs that have a total rise of three feet or more. Certainly the stairway that we observed in La Huerta, Mexico (photo above) as well as the rooftop deck do not meet current safety standards. Railings: U.S. handrails for stairs with one side against a wall: 30-38"
Handrail continuity: handrails should be continuous - that is a hand can slide along the rail without interruption from above the top riser to above the bottom riser; handrails can be interrupted at a newel post at the ends of the stairway. Reader Question: Do stair railings need to be continuous? From ground floor to first floor the wall mounted handrail is on the LEFT, From first floor to second floor the handrail with the balustrade is on the RIGHT. Is this fully complied with Building Regulation and Code of Practice of Canada ? Please advise, many thanks ! Reply: Yes handrails should be continuous. And should return to the walls too. But between floors, depending on landing conditions, railings may be interrupted by doors, floors, etc. As we stated more succinctly at the top of this article, guard railings should be continuous, but the railing can stop or be interrupted at a newel post or return at the railing ends at the bottom or top of the stairs. Railings should not be interrupted by posts within the "run" of the railing. And where there is no newel post (railings are attached to the building wall) most jurisdictions will also require a handrail "return" that connects the end of the hand railing to the interior wall so that someone who grasps the railing during a fall won't have their hand slip off of the railing end. Our stair rail photo (above left) is from a stairwell that we just completed at a home in New York (courtesy of Eric Galow Homes, Lagrangeville, New York). Stairways that end at a landing surrounded by walls or at a building floor are likely to have their handrails stop too at each level. Then the rail along stairs to the next floor will begin anew. Of course if your landing also has handrails (as would be required at least on a landing that had an open side (that is, no building wall), then we'd expect the stair rail to connect to the landing or balcony railing except where interrupted say by a doorway or an open floor on that level. What I mean to say is that there may be practical reasons for a railing to change sides from one stairwell to another in a building. In the stairwell shown above, safest would have been a stair railing on both sides of the stairway but we didn't want to give up the passage space to a second rail. The building department accepted a continuous handrail with returns on the left side of the stair as shown. See GUARDRAILS on BALCONIES, DECKS, LANDINGS where we describe details about railings on landings and open hallways or other horizontal walking surfaces. However it's up to the local building officials to interpret the building codes and to tell you what they require. Since stair falls are one of the most common injury hazards in buildings it's worth a call to your local building department for an answer to your question. Let us know if your local building inspector agrees that railings should indeed be continuous. Reader Question: Is it "legal" for a basement stair to have no handrailing? Our photo (at left) shows a common but unsafe lower floor or basement stair condition in an older home. This stair is missing both handrailings and a stair rail or stair guard along the stair open side. To make it possible to move large furniture or other objects between floors someone has removed the handrail and balusters that were originally installed on the open side of this stairway. We are sure that a stair rail was originally in place because we see the bottom newel post in our photo. This is an unsafe stairway - the rail and balusters should be replaced. If the stair is more than three feet wide (probably it's not), and for all stairs in some jurisdictions, a handrail may also be required along the wall. The "legality" of this or any other building condition is in the final hands of the local building code department and officials. Watch out: sometimes a local building department or official will issue a certificate of occupancy or "CO" on a building with conditions like the one shown here, either because the site was not actually visited (instead the "CO" indicates that there were "no issues on file") or because the official just didn't notice or didn't recognize an improper or unsafe condition. Nevertheless, a "CO" does not prevent accidents nor litigation. "Saying it's OK" doesn't make it "OK" if an unsafe condition exists, and if there is an injury the building department is not going to pay the injured person's medical bills. see GUARDRAILS on BALCONIES, DECKS, LANDINGS (railings on landings and open hallways, porches, screened porches, balconies that are more than 30" above floors or grade). On the website Apartment Therapy [http://www.apartmenttherapy.com/before-and-after-an-unfinished-attic-turned-modern-studio-242931] they keep showing this one house without a railing and without a wall of any kind to prevent falls. 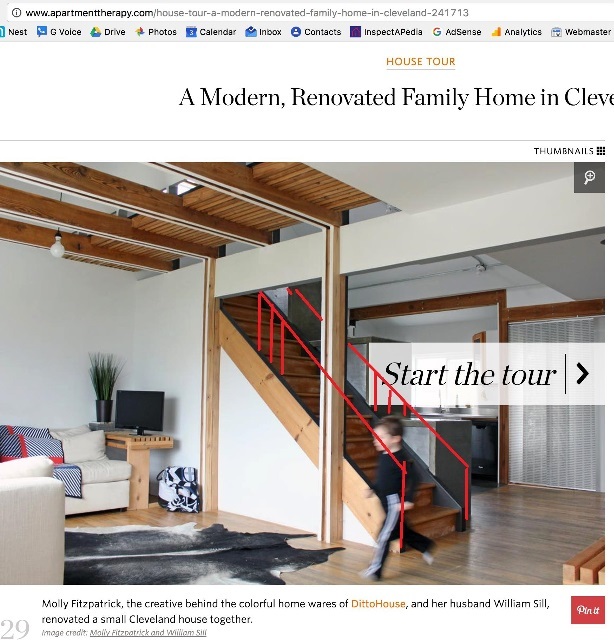 They have posted this house 4 times and my concern is that this type of remodel may become the new trend in home renovations (open stairs becoming the new open concept). Can anyone here point out the specific code violations they are obviously breaking? Interesting photos, Anon. OPINION: In your first image cited and annotated above I see what looks like multiple dangers, with the reclama that we really cannot see the exact conditions at this home. In the site's photos we also see that the handrail at the stairtop landing is just about a foot over the landing walking surface - hardly graspable by anyone descending the stairs unless they're going to slide down on their belly as we did in fraternity hazing days. The same website shows basement stairs open on both sides with no stair guard and no handrails. In building inspections when we find a home with no rails at all along open stairs and balcony-walkways, we infer that these (often beautiful) open designs were built without a building permit, certainly without inspections and approvals by any building department in North America. E.g. California 2007 Building Code (effective 1 January 2008) for safety guardrails on balconies, decks, and on the horizontal area of stairway landings for walking areas whose surface is more than 30-inches above adjacent walking surfaces (or the ground) for Group 2 individual residential dwellings as well as for Group-3 occupancies specifies that the guardrail must be 42-inches or higher. 1003.3.3.4 Stairway landings. There shall be a floor or landing at the top and bottom of each stairway. The width of landings shall not be less than the width of stairways they serve. Every landing shall have a minimum dimension measured in the direction of travel equal to the width of the stairway. Such dimension need not exceed 48 inches (1219 mm) where the stairway has a straight run. (B) A stair rail consisting of a top rail and mid-rail along each unprotected side or edge. This separation of handrail from stair rail appears intended to permit the construction of the equivalent of a "guardrailing" along open stairways and consisting of not just the horizontal members described in (B) above. But along an open stairway there will also be a requirement for vertical balusters or other means of enclosing the open or unprotected side or edge. Here "unprotected" side or edge means an "open" stairway - that is, stairs that do not run along an enclosing building wall. I will post excerpted photos of the unsafe stairs you ask about along with arrows pointing to unsafe conditions that one can see in the image. There may of course be other conditions that need attention but that we cannot see. 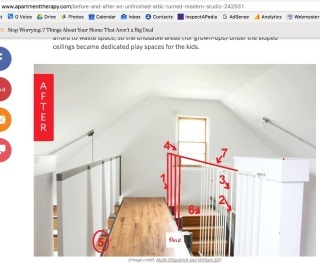 The same remodeling job was consistent in its design as illustrated in the second image above where open stairs to a basement have no guards and no handrails. Open stairs look nice and they make it easier to carry stuff up and down the stairway, but they are unsafe and in most jurisdictions they would not be permitted by local building officials. Perhaps a licensed design professional put her reputation and resources on the line with these remodeling jobs that in our view are unsafe. That is to say, in some jurisdictions the building inspection official will defer to singed-off plans from a licensed professional engineer or a registered architect. A "sign-off" for unsafe stairs won't put the cast on a broken leg nor bandage a cut head when someone falls down these stairs or walkways. Question: how many railings do I need for a 16 foot wide stairway? How many railing do I need on a 16 foot wide deck box stair case? Ask your local inspector the maximum allowable stair width between rails. Typically it's 36" but they might let you get away with just 3 rails, one on either side and a center one leaving 4 ft wide stairways. The decision is local. Inspecting quite a few very wide staircases I have never seen more than one central handrailing, even when that means that stair users who might choose to walk down the center of the clear stairway space may not have a handrailing within immediate reach. Above: a wide stairway at the west end of Grand Central Terminal in New York City uses a central handrailing as well as continuous handrails at either side of the stairs. Walkers on either side of the central handrail have both the centeral and side railing within easy reach. On wider stairways such as the stair shown earlier in this section, walkers may be able to pass down the stair, by choice, out of reach of a handrailing. Our photo illustrates a handrail that is indeed "graspable"
Details about the codes for and construction of properly graspable handrails are at GRASPABILITY of HANDRAILINGS. Excerpts are just below. If the horizontal profile of a stairway handrailing is too fat (we give an example below, thumb grooves help but don't eliminate the hazard - for oversized stair rails simply can't be grasped securely. These two sketches (above and below) are found in the California Building Code for stairs and railings . Continue reading at GRASPABILITY of HANDRAILINGS or select a topic from closely-related articles below, or see our complete INDEX to RELATED ARTICLES below. Or see HANDRAIL FAQs-2 recently-posted questions & answers that appeared originally on this page. 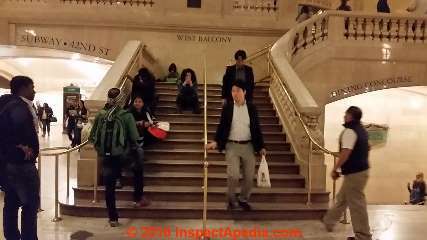 HANDRAILS & HANDRAILINGS at InspectApedia.com - online encyclopedia of building & environmental inspection, testing, diagnosis, repair, & problem prevention advice. Uniform Building Code Stair Specifications: UBC 1003.3.3.6 1997 or later specify handrail requirements, railing heights, rail widths, baluster spacing, stairway types, and guardrail specifications.